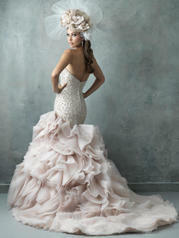 Breath-taking mermaid featuring dramatic organza ruffles to offset the structured crystalline bodice. Couture gown. Originally valued at $5,175. See store or contact us for pricing details.